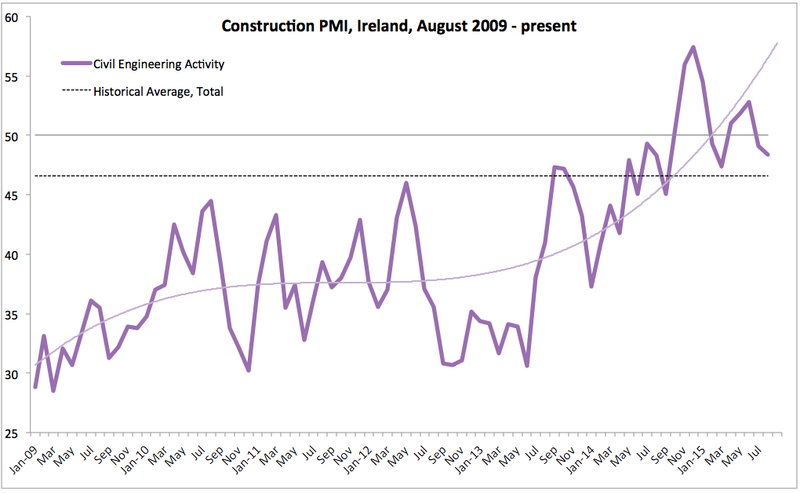 Irish Construction Sector PMIs for August showed moderate de-acceleration in sector growth. 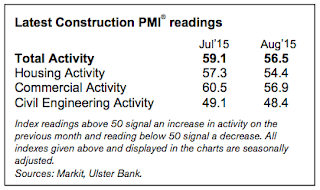 Overall Construction Sector PMI stood at 60.4 in 3mo through August 2015, up on 57.8 for the 3mo average through May 2015, but down on same period a year ago (61.3). 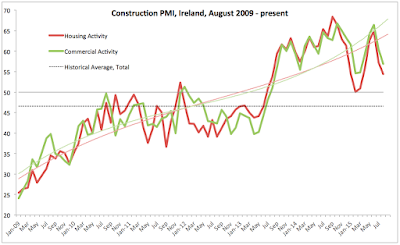 Housing Activity sub-index posted deterioration m/m. However, on a 3mo basis the index through August 2015 (58.7) was up on the 3mo average through May 2015 (56.5), but down on 3mo average through August 2014 (63.5). 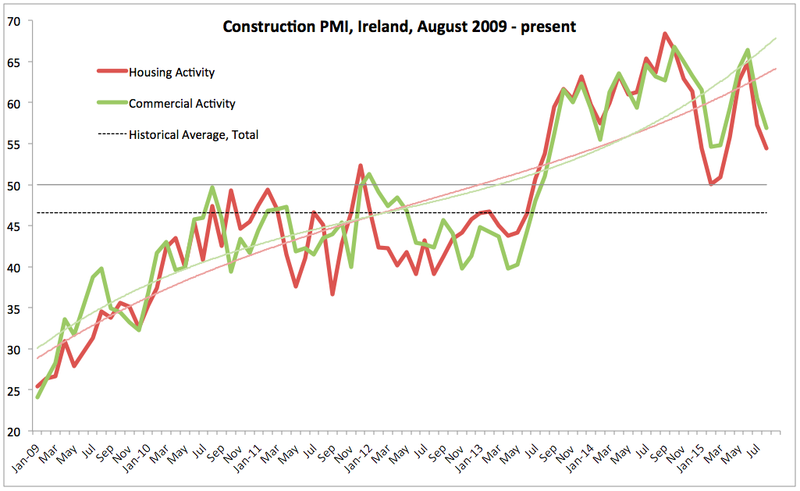 Commercial Activity sub-index posted deterioration m/m. On a 3mo basis the index through August 2015 (61.3) was up on the 3mo average through May 2015 (59.4), but down on 3mo average through August 2014 (62.4). 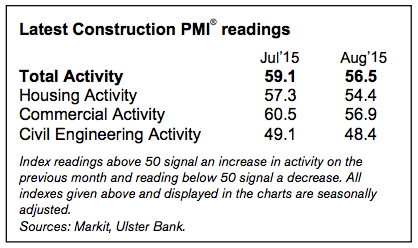 Civil Engineering activity sub-index posted deterioration m/m and a reading sub-50.0 for the second consecutive month. On a 3mo average basis, 3mo average through August 2015 was at 50.1, identical to the 3mo average through May 2015 and up on 47.6 average through August 2014. Thus, all sub-indices have deteriorated on a m/m basis, and all, with exception of Civil Engineering, posted deterioration y/y on 3mo average basis. 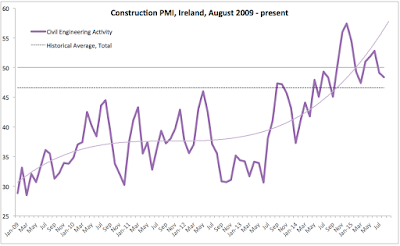 As shown in the chart below, two key sub-indices of construction sector activity remain above 50 mark, but a sharp deterioration in overall growth momentum for the second month in a row. Both sub-series are signalling potential reversal in the positive momentum trend from September-November 2014 on.